The new pain relieving patch from Salonpas is the best solution for stiff neck, sore shoulder, backache and joint pain. This patch has three active ingredients in a more flexible, 20% larger and easy to apply patch. The patches provide long lasting and effective relief for up to 8 hours. Salonpas® Pain Relieving Patches provide temporary relief of minor aches & pains of muscles & joints associated with Salonpas Pain Relieving Patch, 140 Patches. Instructions: Clean and dry the affected area before application. It will be more effective when used after a hot shower or massage. Do not apply to wet or sweaty skin. Warnings: For external use only. Trending at $14.19eBay determines this price through a machine learned model of the product's sale prices within the last 90 days. 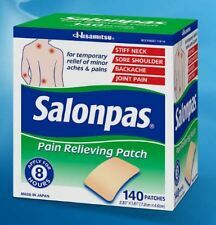 Salonpas® Pain Relieving Patches provide temporary relief of minor aches & pains of muscles & joints associated with: Arthritis Strains Bruises Sprains Powerful Relief When and Where You Need It. 3 Powerful pain fighters that work at the site of pain. Provides up to eight hours of targeted relief. 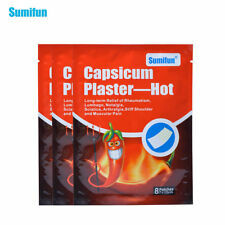 For long lasting heat, hot sensation relief. Stretchable breathable cloth. 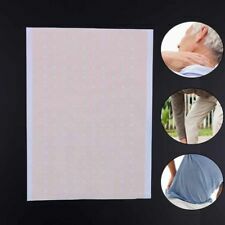 Magic magnetic pain relieving patch is a soft magnetic patch for pain relief. It is a creative integration of magnet biologic technology and Chinese traditional acupuncture therapy, which consist of hypoallergenic self-adhesive plaster and magnetic powder. Tiger Balm Patch is a flexible pain relieving patch. Once applied, its ingredients penetrate the skin and are absorbed, thus stimulating blood circulation around the area of pain. Its thin design ca n be comfortably worn unnoticed underneath clothing. Quickly relieve various pains associated with Quickly relieve various pains associated with muscle strain, neck pain,rheumatic arthritis, hyperostosis, knee joint ache, tenosynovitis, strain &sprain, sciatica, fibromyalgia. Salonpas is the World's No.1 OTC Topical Analgesics Patch. 140 Patches. Camphor 3.1% - Topical Analgesic. Pain Relieving Hydrogel Layer. Ask a doctor before use if you have redness over the affected area. Powerful Pain Relief. Open Pouch and remove patch. If desired, cut patch to size. Also available in Regular size. 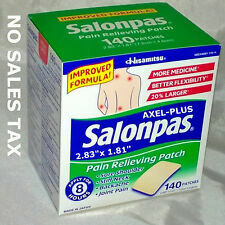 Salonpas Pain Relieving Patch, 140 Patches. These comfortable, effective topical pain patches have3 powerful pain fighters that work at the site of pain. Whether for your back, shoulders, neck or legs, Salonpas Pain Relieving Patches can provide hours of relief. 24Pcs=3Bags × 8Pcs (8 pcs in 1bag, ). Rash,ache or excessive skin irritation occurs. If the pain is persistent 8-12 hours after the first patch and thesecond patch may be applied. Only use one patch to the affected area, the patch can last up to 8-12hours. POWERFUL PAIN RELIEF for chronic conditions like arthritis, rheumatism, joint pain, sciatica, sore muscles, stress related pain, inflammation and back pain. We have combined natural Hemp Seed Oil with pain relieving synthetic ingredients for a fast and soothing relief. 3" x 6" USA Made OTC 4% Lidocaine patch that STICKS ! If you used other types you know they don t stay on well. Ours stays on so it can work, not fall off easily-SIMPLE. Use the patch that athletes use, Not PAID ones. Compare to Salonpas Pain Relieving Patch. These comfortable, effective topical pain patches have3 powerful pain fighters that work at the site of pain. Whether for your back, shoulders, neck or legs, Salonpas Pain Relieving Patches can provide hours of relief. Cheezheng Pain Relieving Plaster 5 patch. Topical analgesic patches, like Salonpas® Pain Relieving Patches, are a great alternative to gels or creams. When applied properly, Salonpas patches stay in place and can be worn easily under clothing. Salonpas Lidocaine 4% Pain Relieving Gel-Patch NIB 4 Boxes of 6 Patches Ea. These are New In Sealed Boxes, Expiration Date 06/2019. 4 Boxes of 6 patches each. They were bought for joint pain but no longer needed. 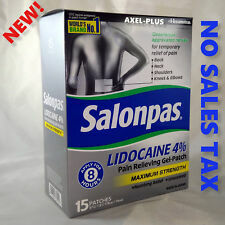 4.5 out of 5 stars - Salonpas Lidocaine 4% Pain Relieving Gel-Patch NIB 4 Boxes of 6 Patches Ea. 63 product ratings63 product ratings - Salonpas Lidocaine 4% Pain Relieving Gel-Patch NIB 4 Boxes of 6 Patches Ea. The Tiger Balm Pain Relieving Patch is designed to relieve muscle aches, strains, stiffness and pain caused by arthritis, as well as back pains. The flexible patch works by applying it to the skin of the affected area. 200mg chondroitin. contains 500mg glucosamine. exp date 10/2020. Smooth that side over the area where you want pain relief. As you remove the other half of the plastic backing, smooth the remainder of the patch over the pain area. Remove the plastic backing from one side of the patch. 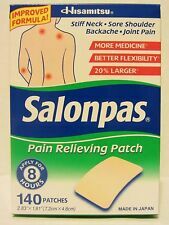 (2) Salonpas Pain Relieving Patches LARGE 5.67" x 3.62". Size: 6 patches each. 100% AUTHENTIC. ---Use for temporary relief of aches and pains related to rheumatism, arthralgia, lumbago, neuralgia, muscular aches, sprains and contusions. ---Directions: First clean the skin of the affected area and dry it, then tear off the plastic cover and stick the plaster on the skin. Each plaster can last for 8-12 hours. ---10 Patches per bag. 100 patches in total. Patch Size: 7cm×10cm ---The product name in Chinese is 羚锐壮骨麝香止痛膏. This plaster is an OTC product approved by Chinese National Drug Administration. Approval filing number is Z41020300. Rash,ache or excessive skin irritation occurs. If the pain is persistent 8-12 hours after the first patch and thesecond patch may be applied. Only use one patch to the affected area, the patch can last up to 8-12hours.